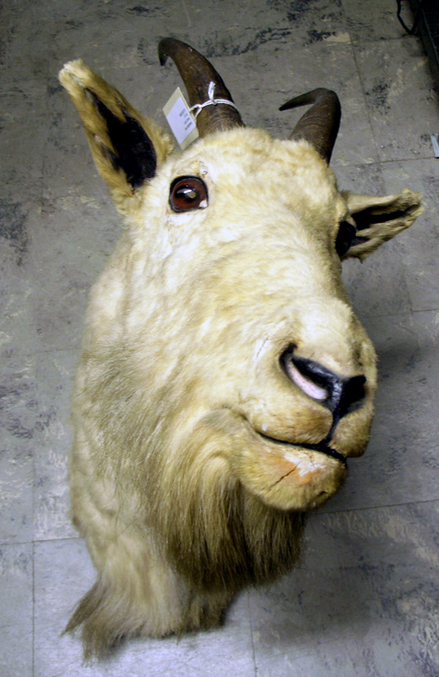 This is one of two Canadian mountain goats given to Princeton University by J. Monroe Thorington, Class of 1915. As a young man,Thorington (1894-1989) spent his summers in the Bavarian Highlands and that was all it took to ignite a life-long enthusiasm for mountaineering. He became an avid explorer of the Canadian Rockies watershed, in particular, where Mount Thorington was named after him. Roy, as his friends called him, graduated from Princeton University in 1915, received his M.D. at the University of Pennsylvania in 1919 and after residency at the Presbyterian Hospital became a practicing ophthalmologist. He worked at the American Ambulance Hospital, Neuilly-sur-Seine, France and then, spent six years as an Instructor in Ophthalmology at the University of Pennsylvania. But it was mountain climbing that remained the focus of his life. A scholar of alpinism, Thorington published an long series of guidebooks for mountaineers, biographical travel journals, and dozens of articles for international sporting magazines.